For the cake, follow the instructions on the back of the box. Divide batter into two bowls and dye one yellow and one orange. Preheat oven to 350°F. You can either line two 6 cup cupcakes pans with paper or spray them with cooking spray. Pour yellow cupcake batter into one pan and orange into another. Bake for 10-15 minutes. After the cupcakes have cooled, remove them from the pan (unwrap cupcake liners if you used them) and cut the cupcakes (horizontal) in half. In mini mason jars, layer a yellow cupcake, orange cupcake, frosting, and a sprinkle of candy corn. Repeat once and frost the top. Then add candy corns to the top for garnish. My favorite season is here!! It’s finally time to break out the Halloween treats and goodies, with candy corn being the main one! I love the butterscotch taste of candy corn. There are so many ways you can incorporate them into your Halloween desserts! I’m always on the look out for party-friendly desserts – especially ones that you can set out on the table for easy serving or to add a gorgeous aesthetic to the dessert table. 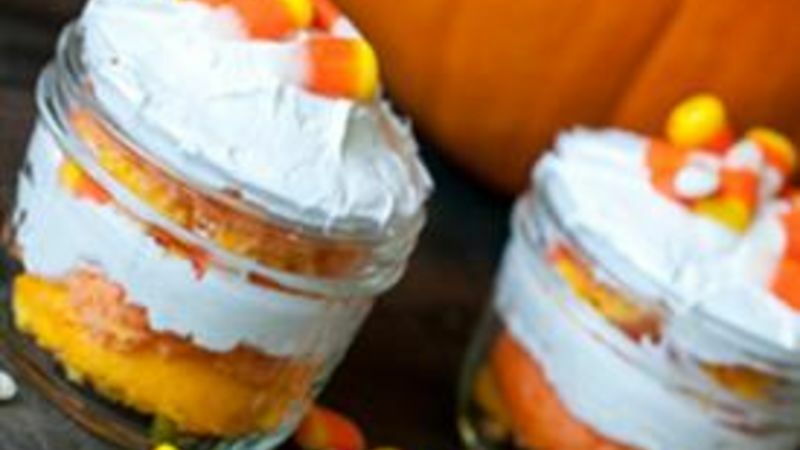 Candy Corn Trifles are particularly fun and festive using Halloween colors and Halloween’s most popular candy. They’re layered with Betty Crocker™ Super Moist™ white cake, Betty Crocker whipped white frosting and candy corn, giving them the perfect sweetness for any Halloween party! Step 1: Gather all your ingredients. Step 2: Divide the Betty Crocker cake batter into two bowls. Using food coloring, dye one yellow and one orange. Step 3: Bake cupcakes for 10 to 15 minutes at 350F. Step 4: Once the cupcakes are baked and cooled, cut them in half (horizontally) and set aside. Step 5: In mini mason jars, layer a yellow cupcake, orange cupcake, frosting, and a sprinkle of candy corn. Step 6: Repeat once and frost the top. Step 7: Add candy corn to the top for garnish.